Other photos: Manufacturer Provided Image, Manufacturer Provided Image, Starb. Profile, Manufacturer Provided Image, Manufacturer Provided Image, Optional Balcony photo, Aft Deck wet bar with refrigerator and ice maker, Aft Deck, Aft Deck dining for 8 Guests, Salon Looking Forward, Optional-Sliding doors with Balcony, Optional Balcony photo, Salon Looking Forward, Salon Looking forward, Formal Dining for 8 Guests, Formal Dining area, Formal Dining area, Photo 18, Day Head, Huge Atrium Galley, Galley Area, Built in Sub Zero Refrigerator and Freezer, Galley, Lower Cabin Stairwell, Lower Cabin Hallway, Full Beam Master Cabin, Full Beam Master Cabin, Master King Size Bed, Master Cabin, Master Dressing vanity, Master Cabin Head, Huge master walk in shower, Master Head, Master Cabin, Lower Cabin Hallway, VIP Cabin, VIP Head w/ Separate Shower, Port Stateroom, Port Guest Cabin Head w/ Separate Shower, Starb. Guest Cabin, Starb. Guest Cabin Head w/ Separate Shower, Starb. Guest Cabin Shower, Internal Bridge Stairs, Bridge Wet Bar w/Refrigerator and Icemaker, Bridge Helm with HattCon and Nav. Screens, Port Side Bridge L seating, Bridge Looking aft, Bridge looking forward, Bridge sofa and tables, Bridge Dining table, Upper Aft Deck with Sail Shades, Upper Aft deck, Bridge cabinet with twin Kenyon Grills and refrigerator, Aft Bridge stairs w/ door, Full wide and deep walk arounds, Bow, Bow, Bow Seating for 8-10, Bow Seating for 8-10, Bow Seating for 8-10, Bow Sunpad, Crew Cabin, Captains Cabin, Crew Galley Area with transom service Door, Photo 65, Huge Engine Room, Engine Room, Upper Deck Floor-plan, Main deck Floor-Plan, Lower Cabin Floor-Plan, 8 Blade High performance props, 8 Blade High performance props, Underwater lights, 2018 Novurania DL460 w/90hp Yamaha. 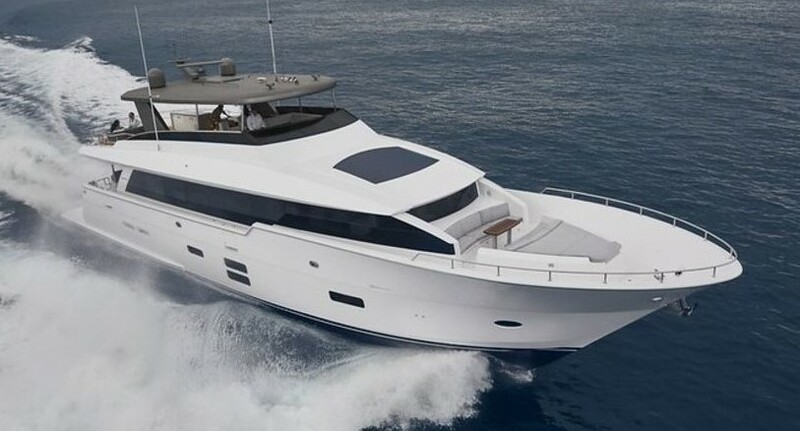 SnowGhost is the first hull of the award winning M90 Panacera series from Hatteras Yachts. She is featured in several Yachting articles and received 2018 Robb Reports (Best Of the Best Award) This is a fully loaded yacht that features the state of the art HattCon touch screen ships system. The owners captain keeps SnowGhost in meticulous turn key condition. SnowGhost has just received her second annual CAT Engine and Kohler Generator services since delivered new. Her twin upgraded CAT C32A 1900hp engines have extended CAT Platinum Warranties until April 2023. If you are in the market for an almost new 90-100' Pedigree built Yacht, put SnowGhost on your must see list! Running and video walk through coming soon!